File photo: The scene on Pennsylvania during the 2011 Capital Pride Festival. This year's Capital Pride celebration is themed "Make Magic Happen." Capital Pride will feature a parade June 11 and a festival and concert June 12. The parade, festival and concert are for all ages, and admission is free. This year’s theme is “Make Magic Happen,” celebrating the community’s power to make change on the local and national scales. Start digging out your rainbow attire. D.C.'s Capital Pride is back for its 41st year, bringing a parade, food, vendors, performers and more for a family-friendly celebration of pride. This year's theme is Make Magic Happen, celebrating the community's power to make change on the local and national scales. More than 180 organizations are set to participate in the Capital Pride Parade this Saturday, which will feature floats and other vehicles, walking groups and entertainment. Starting at the intersection of 22nd and P streets NW and ending at 14th and R streets NW, the parade will stretch 1.5 miles and pass through Dupont and Logan circles (see the parade route here). Parade participants include Capital Pride Heroes, Engendered Spirit award recipients, politicians, community groups and more. The parade will last from 4:30 p.m. to 7:30 p.m. this Saturday. Attendance is free, but for $100 you can go to a Crack of Noon Pride Brunch from noon to 3 p.m. with actor and comedian Leslie Jordan, the 2016 Parade Grand Marshal. Jordan won an Emmy Award in 2006 for his role as Beverly Leslie on "Will & Grace." The celebration continues Sunday with the Capital Pride Festival and the Pride Concert. More than 300 groups, including community groups, sponsors, businesses, restaurants and vendors will set up exhibits at the festival from noon to 7 p.m. The festival will take place between 3rd and 7th streets NW on Pennsylvania Avenue NW (see the festival map here). Note that the Capital Pride Alliance cautions against bringing pets because of the crowds and hot weather. Meghan Trainor is one of seven headliners to join the concert lineup. The Capitol Concert Stage, on 3rd Street NW and Pennsylvania Avenue NW, is the main stage. But you can also catch performances on Monument Festival Stage on 6th Street NW and Constitution Avenue, and the Dupont Dance Tent on 6th Street NW and Pennsylvania Avenue NW. The concert will last from 1 p.m. to 9 p.m., but the Monument Stage and Dupont Dance Tent will close at 7 p.m. Donations are encouraged, but admission to the festival and the concert are free. Tickets into the pit by the stage are $35, though, with VIP tickets available for $150. 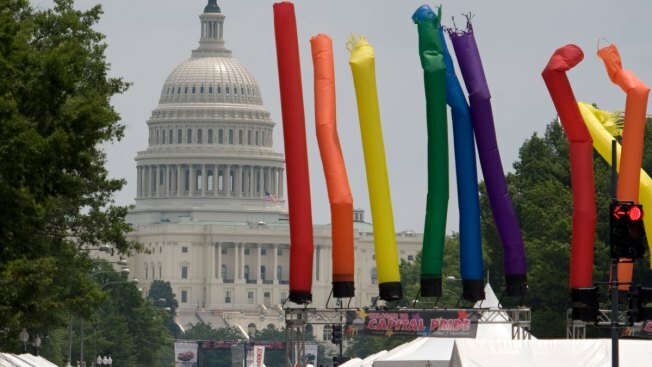 Capital Pride attendance totaled 350,000 in 2014, and attendance rose in 2015, with 250,000 people at the festival alone. While the all-ages parade, festival and concert are the main events, Capital Pride has been holding other festivities for almost two weeks leading up to the weekend of June 11-12, including a magic show, a rooftop pool party and a 5K race. You must purchase tickets to attend these earlier events, and some are restricted to ages 21 and up.